Leek (Allium Porrum) is a herbaceous plant belonging to the family of Alliaceae, the same botanical family to which onion and garlic also belong. Leek has been known and used for centuries for its medicinal properties, although nowadays it is used mainly as food or flavor. The edible parts of the leek plant are the light green stalk (or stem) and its white bulb, while the dark green leaf sheaths are usually discarded because of their fibrous consistency. However, it would be wise to use the dark green leaves as well (finely minced or juiced), because they have high content of minerals and vitamins. Although leeks have a sharp flavor, their taste is sweeter and more delicate than that of onions. Leeks can be used in a variety of dishes, either raw or cooked, or they can be used to prepare delicious juices. Leek is composed primarily of water, about 90%. It also contains dietary fiber, minerals—nickel, potassium, iron, magnesium, calcium, manganese, phosphorous; vitamins A, C and K, folate, and moderate amounts of the B vitamins (B1, B2, B3 and B6). Leek is an excellent dietary food, which is very low in calories but is packed with multiple healthy nutrients and phytonutrients. Leeks have been known since time immemorial for their medicinal properties that are antiseptic, antibacterial and antifungal. So, if you like the sharp flavor of leek, you can benefit from its juice, of all its excellent healthy properties that are good remedies for a wide range of disorders. Anemia: Thanks to its content in iron, which is essential for the synthesis of hemoglobin (the protein in red cells responsible for carrying oxygen throughout the body) leek can help fight various types of anemia, especially those resulting from iron deficiency. Its vitamin C content helps make effective iron absorption. Anti-inflammatory and antiseptic: Due to its anti-inflammatory and antiseptic properties, leek juice can be used as a valuable aid for treating arthritis, gout and inflammation of the urinary tract. Aphrodisiac: Leeks, onions, garlic and celery have been known from centuries for their aphrodisiac effects. Try to make a juice with leeks and celery, and you will soon get into action! Balsamic action: Due to its content in volatile oils, leek juice does have a beneficial, balsamic action on the respiratory tract. So it can be used to relieve the symptoms associated with flu, cold and hay fever. Digestive health: Leeks can help regulate intestinal function and motility, due to their content in fiber. They also help to repopulate the good bacteria in the colon, thereby aiding digestion and reducing intestinal bloating. High blood pressure: Leeks are high in potassium, which promotes diuresis thereby helping to lower and regulate blood pressure. That’s why leek juice is particularly recommended for people suffering from high blood pressure. High cholesterol: Leek does have an anti-cholesterol and anti-atherosclerosis action. It helps reduce both the absorption of cholesterol from the intestine, as well as the oxidation of LDL-cholesterol in the blood, thus preventing one of the first steps in the formation of atherosclerotic plaques. Nervous system: Magnesium, phosphorous and folate are important nutrients needed for healthy functioning of the nervous system. They help improve concentration, memory and the brain’s ability to process information. Folate is also essential to prevent brain defects in babies. Purifying action: Perhaps the most characteristic action of leek juice is its purifying effect on the whole body, since it helps eliminate toxins from the body by enhancing the cleansing of the colon. Leek juice can be prepared from the stalk, bulb, and leaves. The dark green leaf sheaths are very rich in minerals and vitamins. Leek juices blends very well with juices of carrot and celery. 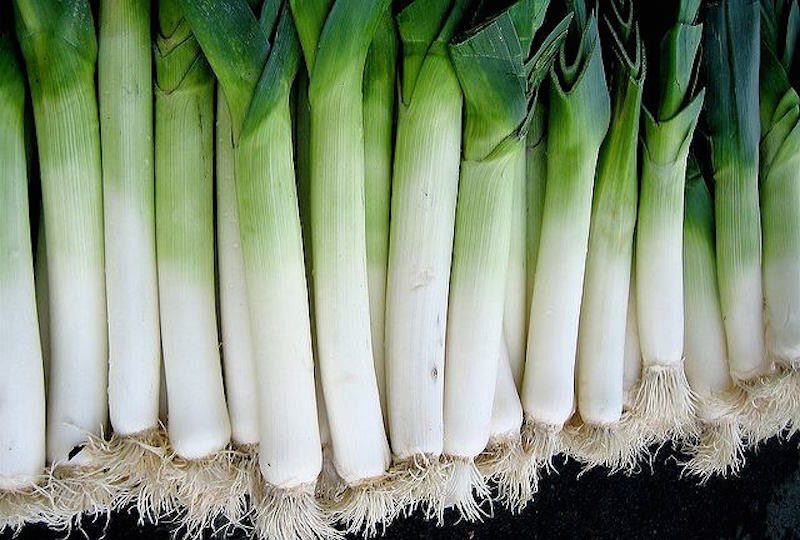 Leeks contain very small amounts of oxalate and should be avoided by individuals who have a history of oxalate kidney stones. They are also high in nickel, thus its consumption should be avoided by individuals with nickel allergy.